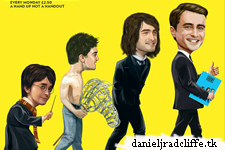 Daniel Radcliffe is on the cover of this week's The Big Issue (UK) with the title The Ascent Of Dan. Below you can read a part of the interview in which he talks about politics, Donald Trump, meeting Jeremy Corbyn and more. Update: 21st September 2015. The full interview is added below. Also more about the upcoming projects such as Young Americans (shooting starts by the end of the year) and Brooklyn Bridge. You have been away a few months – have you noticed a change in the country? I am fresh to it all but it is incredible what is happening with the Labour leadership election. It is so nice to have people excited about somebody. We are so used to politicians lying. For my entire lifetime, I have never looked at a politician and thought what they were saying was true. Even when they are being sincere, it feels so scripted. This show of sincerity by a man who has stuck to his beliefs long enough that he knows them and doesn’t have to be scripted is making people sit up and get excited. I read Tories were signing up to Labour to vote for Corbyn. I hope it blows up in their face – an amazing display of arrogance. Last time we spoke you were underwhelmed by every politician on offer. It is generally underwhelming but I feel like I left for two months and walked back into a country where people were excited about politics again. The parties got so close, not just in terms of their policies but of the background of the politicians. It was so similar I think a lot of people didn’t feel that voting would effect change. But now there could be a real choice. I am just happy that young people are excited by a politician, which is something I didn’t think I would see again. Does this mean you are Team Corbyn? You do sound quite enthusiastic. Were you able to keep up with the UK news while you were in New York? When you live and work in America, it is easy to not hear about anything that is happening in another country. We were filming Gamechangers around the time of the general election. But I probably know more about the American presidential election than the Labour leadership race at the moment. Hahaha. No. NO! But do you want to hear about my favourite political conspiracy theory? I’m not into conspiracy theories but I find the people who are into them fascinating. My recent favourite is that Donald Trump is running a false flag campaign for Hillary Clinton. If Trump was secretly working for Clinton to help her win, what would he be doing differently? He is galvanising the crazy right-wing loony end of the Republicans, while turning away the moderates. And if he doesn’t get the nomination he will run as an independent and split the vote. Also, his daughter is best friends with Chelsea Clinton. So much of it makes sense. Do you want to hear the story about when I met Donald Trump when I was 11? He said a fantastically Donald Trump-ish thing. I was going on The Today Show in America during the first press tour for Harry Potter. I hadn’t done much live TV before. Trump was on before me and when he came off someone thought it would be good to introduce him to the kid who plays Harry Potter. I told him I was nervous because I didn’t know what to talk about. He just said, in a very charming way, and I mean that, "You just tell them that you met Mr Trump!" And I think I probably did. You mention filming Gamechangers during the general election – what was it that made you want to tell the story of the creators of Grand Theft Auto? I was obsessed with GTA around the time of Vice City. Those graphics now look quite primitive but I was blown away. I couldn’t believe something so cool and real-looking existed. It is a game I played a lot growing up but I never realised its origins were entirely British. I see Sam Houser, who I play, as a Quentin Tarantino figure, who absorbs so much about films and American culture from a young age. It is like another language to him, and it is one that he is fluent in. It is this amazing story of their drive and creative force – and in this film creativity is coming under fire. Are you still a gamer? Doing this film, I got GTA5 and played for ages, pretending it was research. I enjoy games but I am really crap. That saves me from becoming obsessed – I reach a point where I am so crap that I can’t get any further. Do you see games like GTA as a force for good? For me it is just escape. But a lot of people use games more creatively. People have recreated the opening titles of The Sopranos, shot for shot, in the GTA world. They do mad, cool, weird stuff. I don’t buy into the idea that games with violent aspects encourage violence. In the same way I don’t believe that me enjoying Joe Pesci’s character in Goodfellas will lead to me doing the things he does. If somebody is going to kill someone in a horrible way, they are going to do that whether or not they have bought a game. Every art form is accused of depicting inappropriate things. It is normally a sign of the growth of that medium. JK Rowling wished James S Potter (Harry Potter’s son) a happy first day at Hogwarts and it was retweeted 120,000 times. The world of Harry continues to grow. It is not an active part of my life any more but it is so funny how often it comes up. I was walking down the street yesterday, eavesdropping for about five minutes as a six-year-old kid pestered his mum about when he could watch Harry Potter. She said it was too scary. And a young girl was reading one of the books for the entirety of my flight back from America. It was like the Dead Sea Scrolls. The spine was broken, the pages were scuffed, it was so well-loved. If you created that world, it would be fun to be able to play in it and reimagine it. There is such a yearning to go back into that world. It is great Jo is doing the Fantastic Beasts film. It is a testament to how successful our films were at mattering in people’s lives. Will you be making your own films any time soon? I have written something that I’m working towards directing. But it is terrifying. I become aware of aspects of this industry that, despite working in it for a long time, I have no knowledge of. I am not going to rush but I would love to direct a film before I am 30. The idea of having to make a creative decision every second of the day is something I relish. What are your plans for your time in London? I’m just trying to see as many friends as I possibly can. I saw one of my godsons last night, which was awesome. When I am filming I fall off the map a bit. People ask what I do with my time off and expect me to be leading a very exciting life. It is exciting to me but that’s because I get excited about seeing my friends, which is what I’m doing every evening I am here. My girlfriend lives in New York but we both have time off – so she can hang out and watch quiz shows in England. Exciting times. You’ve spoken in the past about supporting The Big Issue – are you still a fan? Oh yes, I buy it whenever I see it. I can absolutely say that with 100 per cent confidence. Daniel Radcliffe highlights some exciting projects on his horizon. If you’re a Sherlock fan, this is the perfect film for you. Everybody’s there. Andrew Scott plays another very dark character – his eyes look like black whirlpools on camera, yet he is a really sunny, nice guy. He is phenomenal, and James McAvoy was great fun to work with. Hands down the weirdest thing I’ve ever done. So bizarre. A guy has run off into the woods and finds a dead body, who he becomes best friends with. I’ve just finished – and it could be one of the best things I ever do. I’m about to shoot this. Daniel Ragussis wrote it with a former FBI agent. It is about a guy who goes undercover with a terrorist group. A lot of movies introduce a character as smart but when it goes wrong solve the problems by them turning into Jason Bourne. But if you are undercover and you fire a gun, you’re probably the worst agent ever. I still call this film College Republicans. Young Americans makes me think of the David Bowie song. I have been working on it with John Krokidas for two years. I play Lee Atwater, who advised President Reagan. He did a reprehensible thing, a lot of people really hate him, but my God he was so charming. We are making a film about a bridge, so it can be hard to raise the money. But it is really about the people who built Brooklyn Bridge, and it is one of the most extraordinary, inspirational and terrifying tales you can imagine.